Most of us love our trees. They shade your home, add beauty to your yard, and command respect as old, towering life forms that seem to watch over us. Naturally, it’s normal to feel concern when you notice rot developing on a tree’s trunk. 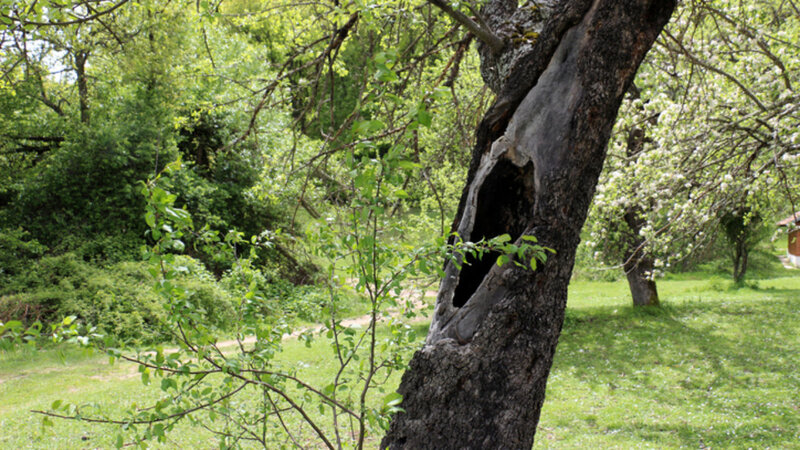 You might hope that you can save the tree somehow… But is that possible? Keep in mind that a tree’s trunk is basically like the stem on a flower. You can imagine that a damaged stem would present a serious problem for the flower, and a tree is no different. While it is sometimes possible to cut damaged limbs, and save the tree as a whole, a rotting trunk indicates a more serious problem. The tree likely won’t be able to “heal”. Typically, rot affects older specimens, and can extend deep into the inside of the trunk. Therefore, once you notice rot on the outside of the trunk, the problem has usually significantly damaged the tree by that point. This can present a serious structural problem as the base of the tree continues to weaken, and now you’re at risk of the whole thing falling… perhaps on your home, car, or even a family member. Having said that, we have seen cases in which the problem is minor, and it is occasionally possible for a tree to heal. The best course of action at this point is to have your tree examined by a professional. We can help you determine whether water, fertilization, and pruning can boost your tree’s health and possibly save it. Or, we can give you an honest assessment of the likelihood that these measures will fail. If we find that your tree is significantly damaged and weakened, for safety’s sake it is usually better to take it down. If you’ve noticed rot on a tree’s trunk, give us a call right away. We can give you an assessment and help you decide upon the safest course of action. If the tree held sentimental value for you, it is possible to utilize some parts of the trunk in various landscaping projects around the yard. Or, you might prefer to grind the stump and plant something new in its place.